Doctor Who: Revisiting RESURRECTION OF THE DALEKS | Warped Factor - Words in the Key of Geek. Tony Fyler awakes from ninety years of mind-numbing boredom. Almost everyone dies. What is somewhat hidden underneath all the bleakness and death is a story that, when all is said and done, makes very little sense. Like the much more liberally-panned Attack of the Cybermen, it also depends to a great extent on knowing your Who history – it’s one for the fans. 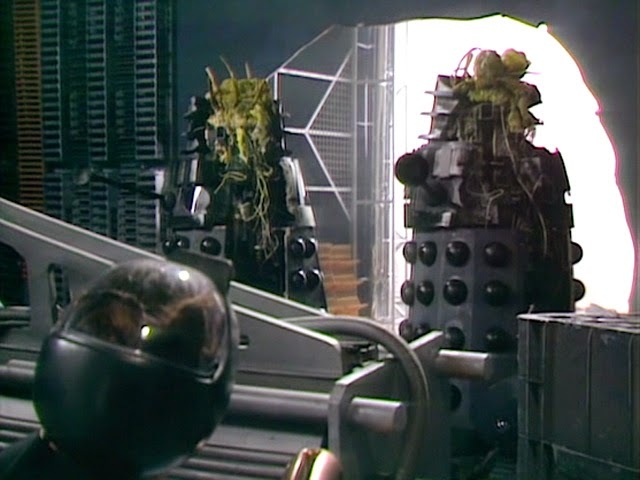 Firstly, the Daleks need Davros again, ninety years after they last… erm… needed him (because that went so well), and for much the same reason – the Movellans are being mean to them, and they need Daddy to help them out, and genetically re-engineer them if necessary. This rather suggests that the Daleks, master trundling brainboxes of the universe, capable of time travel as they are, don’t have the understanding to genetically re-engineer themselves. Not for nothing, but thirty years down the line, even humans could give that some sort of shot. 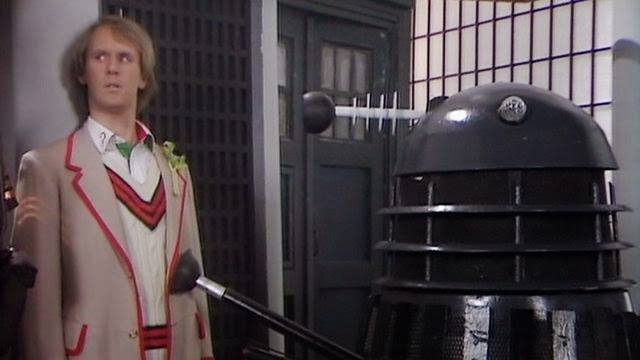 Secondly the Movellan Dalek-eating virus is, for some reason that makes very little sense, ‘hidden’ *cough, cough* in a warehouse on Earth, requiring the Daleks to beggar about building a time corridor to that location. Doors. Just saying – good, proper doors and you wouldn’t have to bother. And thirdly, the whole duplicate plan. Yyyyyes, there’s probably a benefit to doing that on planets where your enemies are really fairly superior to you, like Gallifrey – but Earth? The Daleks could firestorm Earth without too much hassle, so the idea of them creeping about the place and using duplicate humans to subvert the governments of the world speaks of a species that has really lost direction and focus. Granted, this is supposed to be the case, after the Movellan virus decimated them and drove them to the far corners of the galaxy to work on a cure, but as plot-strands to power a story go, the duplicate idea leaves a lot to be desired. Indeed, by the end of the story, the Doctor cares so little about the duplicate threat that he decides to leave it to unravel on its own. If you think about it at all, it makes very little sense. Solution: don’t think about it at all – there’s plenty in Resurrection to love if you can stop the nagging sense of ‘how does that work then?’ nipping at your consciousness. Where Robert Holmes was the undisputed master at building believable, enjoyable secondary characters and making you care about them, Eric Saward by the time he wrote Resurrection was becoming the Anti-Holmes, the master at writing believable utterly miserable buggers who gave the whole tone of their lives a morbid or misanthropic vibe. So in Resurrection, we have the apathetic, almost aggressively unhappy crew of the freighter, Rula Lenska in particular proving a treat as the door-kicking, get-me-the-hell-out-of-here medic, Styles. We have a grumpy, if not particularly misanthropic bunch of squaddies led by a gruff colonel. We have tramps and metal detectorists shot in cold blood by mercenaries dressed up as British bobbies. And we have, most spectacularly of all, Commander Lytton, played by the magnificently craggy-faced, cork-voiced wonder that was Maurice Colbourne (who was soon to make his mainstream breakthrough as Tom Howard in rich-people soapy boat-drama, Howards’ Way). Lytton was the mercenary to beat – or indeed, calmly shoot in the face – all mercenaries, glacial and intelligent enough to survive the day when practically no-one lives. In addition, in the only true element of ‘Resurrection’ in the story, we have a brand new Davros, and with no disrespect to David Gooderson, who played the role in Destiny of the Daleks, we’re back in the territory created by Michael Wisher – a subtle, multi-faceted character who you can’t take your eyes off, thanks to the pitch-perfect vocal work of Terry Molloy. Even though the moment he hears that the Daleks need him again he curses any chance they have of working together by beginning to build his personal power base, this is a Davros we can identify with, harking back to Michael Wisher’s original brilliant scientist-politician, and with the same delicious ability to play the role as flitting from the silkily seductive to the screaming and tyrannical. It’s a powerhouse performance that would see Molloy confirmed as the only Davros for the whole of the 80s, and in plenty of audio plays for Big Finish too. Molloy is certainly one of the most hypnotic elements in Resurrection, and matched with Colbourne’s positively stroppy Lytton, his performance makes for scenes that can still send shivers of delight and fear down the spine. The Dalek entry through the airlock of the freighter is one that stands up in the long history of Dalek reveals – borrowing from the shock factor of episode one of Destiny of the Daleks, they blast the door open and advance, looking just as menacing as they did back in the 70s, if rather newer and less wooden. But we also get the extra treat of seeing them briefly foiled, and exploded – in the 21st century, we’re almost blasé about seeing the mutant creatures that drive the Dalek machines, but this was the first time we’d ever really got a proper glimpse of them, and, at least on first viewing, they didn’t disappoint. While a lot of Dalek standards are here – death squads on an exterminationfest, the Daleks and Davros planning to outwit and destroy each other, there’s also the return of the Genesis dichotomy that would be explored in the next two Dalek stories, consuming the rest of the 80s – where does the loyalty of the Daleks lay? With their creator, or with their Supreme? Which has the best chance of steering the species to its ultimate destiny as rulers of the universe. Given that the Supreme has steered them almost to extinction by the time we come to Resurrection, it’s surprising the rise of Davros’ Daleks isn’t more effective – but then the rise and rise of Davros does continue throughout the 80s, allowing the question to be perhaps best explored in Remembrance of the Daleks. But aside from the scenes of gun-sticks blazing and the existential battle for the soul of the Daleks, there’s a lot more variety of nastiness and death in Resurrection than we’re used to – plague, disfiguring gas (which Lytton and his troopers are immune to, seconds later – just saying), big red self-destruct buttons, and perhaps most of all the use of things that look like ordinary human beings – the duplicate of the colonel shooting Chloe Ashcroft’s Professor Laird in the back (a particularly traumatic moment for UK viewers, as Ashcroft was best known as a children’s presenter of unparalleled ‘niceness’). Ultimately though, perhaps it’s the reaction of the Doctor himself that shocks both we the viewer and his longest travelling companion, Tegan, in Resurrection of the Daleks. 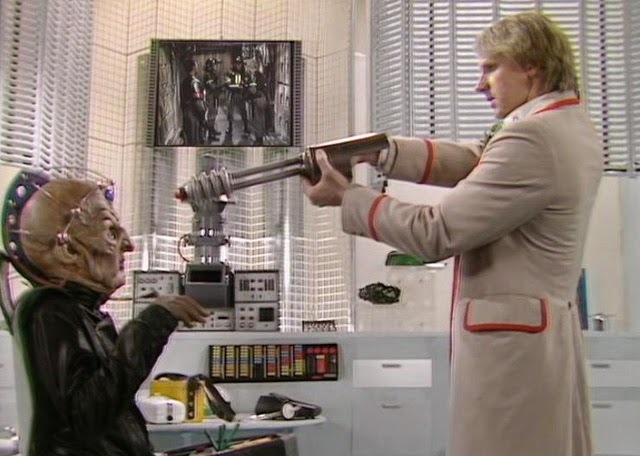 The Doctor, reasoning that he had the chance to destroy the Daleks once before, and that all that has followed has been the result of his failure to to do the universe that dark favour, picks up a gun, and goes to destroy Davros, leaving Tegan mortified, unable to understand the scale or the gravity of his actions. Her Doctor has only ever picked up a weapon in the direst emergencies, like defeating the Cybermen in his own Tardis in the desperate hope of rescuing Adric. Now he’s calm. Sombre. And going to kill Davros in cold blood. Perhaps it’s that moment that informs Tegan’s decision to leave the Tardis and the Doctor behind when all the dying’s done. In a story that’s much more effective if it’s felt than it is if it’s thought about, perhaps it’s that moment of shock at what the Daleks are able to turn even the Doctor into that makes her sure it’s time to leave the time travelling life behind. While she knows the incredible death toll is not his fault, perhaps the image of her friend picking up the executioner’s gun amid so much death and destruction is the spur that Tegan needs to move on. Resurrection of the Daleks is remembered for a lot of the right reasons – its relentless grimness of tone, the Daleks looking notably better than they did in Destiny, the astonishing performances of Maurice Colbourne and Terry Molloy, the latter making Davros truly scary again, the death toll, and Tegan’s tearful, runaway departure at the end. The story remains flimsy at best. But the evocative memories of Resurrection come from the emotional responses it still generates, thirty years on, in the minds of those who watch it.